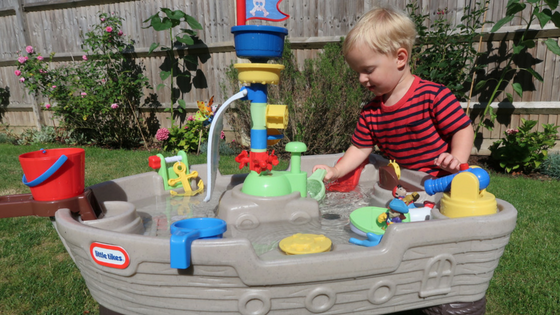 Oliver loves water play, so when Little Tikes offered to send him the Anchors Away Pirate Ship to try out, we couldn’t say no! The table was very easy to assemble, it took me and my husband all of about 15 minutes to put it together. We set it all up in the evening, ready for Oliver to play with when he woke up in the morning. He was so excited when he saw it out on the patio in the morning, and he was straight out there playing! We love the pirate theme. You get 2 pirate characters, a shark, 2 boats, there is an anchor which you can lower, a steering wheel, a plank and a crows nest. Oliver really enjoys playing with the two little characters (and the shark) and putting them in the boats and watching them bob around in the water. The crows nest is where you can pour water into, and below it there are spinning wheels for the water to move. There are two cups which have little holes in the bottom and a handle. 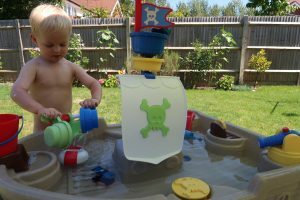 Which can be used for either just water play or to scoop the water in to pour into the crows nest! There’s also a big bucket which sits on the plank, which can be filled with water. This has been the perfect toy for the long hot summer we are having, and I know with both my boys we are going to get years of use of it! We were kindly sent this for the purpose of a review. All words and opinions are my own.